It would even be an understatement to say that "Life of Pi" is one heck of a visual feast. It not only presents the viewer stunning vision, mastery in visuals and cinematography but it also has a narrative like no other. One that we have not experienced in a very long time. It also helps a lot that "Life of Pi" fully used 3D technology to its fullest capabilities and not since James Cameron's "Avatar" have we been amazed with 3D's potential as a film medium. We can only say this about "Life of Pi": you don't just watch it, you wholly experience it - you live within the narrative. Pi Patel (Irrfan Khan) is an immigrant from Pondicherry in India living in Montreal, Canada. He is suddenly approached by a local novelist who has been referred to him by his uncle. The uncle tells the novelist that Pi's life story would make a great book and one that will make him believe in God. 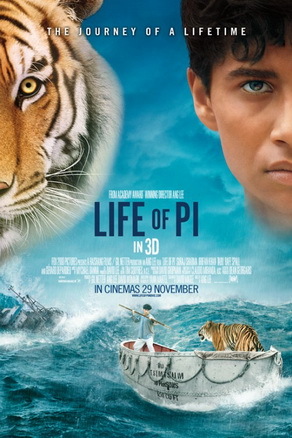 Pi then tells an amazing tale of his childhood in India and how he, his 16 year old self (Suraj Sharma), survived being lost at see for 227 days stuck with a Bengal Tiger peculiarly named as Richard Parker. "Life of Pi" is the quintessential film to watch in 3D. The visual majesty it presents not only personifies what good can come out from a technology haphazardly used most of the time but most importantly, it integrates with the narrative so much that one cannot live without the other. Because here's the thing, visuals alone does not and should not personify "Life of Pi". It is simply more than that. It is the sum of its parts. Superb acting from its leads especially Suraj Sharma as the young Pi brings out the emotion, the struggle of his character as he tries to survive the vastness of the ocean, doubt of God's purpose for him and co-existing with an aggressive Bengal tiger. It also presents a thought-provoking and emotionally-engaging narrative. The ending is the clincher. Without spoiling much, the choice you decide to believe make you think heavily on who you really are and how important your beliefs are in your life. "Life of Pi" is not only a visual and artistic marvel we get to experience once in a blue moon. It is also one film that will make you think even after leaving the cinema. - no reason not to watch "Life of Pi"